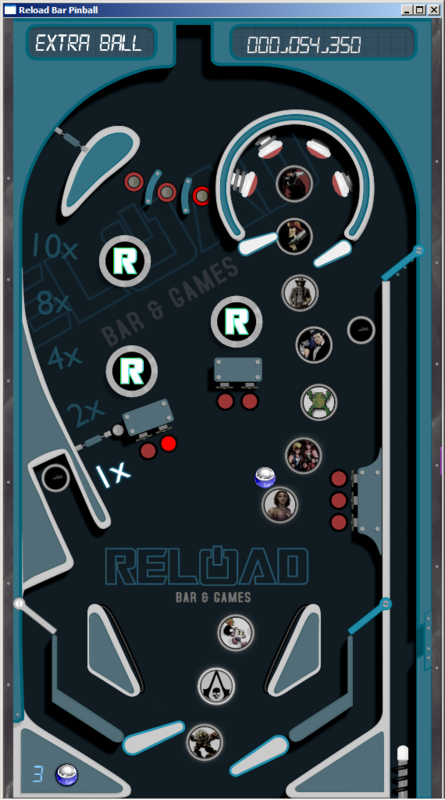 Something that has been in development for over eight months is another pinball game, but this one uses Orx to talk out to hardware, using an embedded micro-controller and USB library. 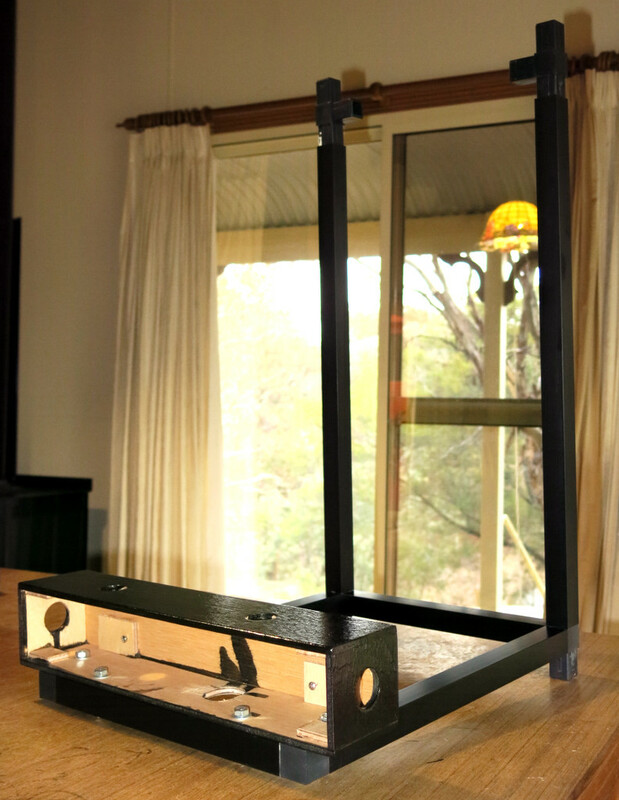 The resulting hardware and frame will be installed at Reload Bar & Games in Canberra. 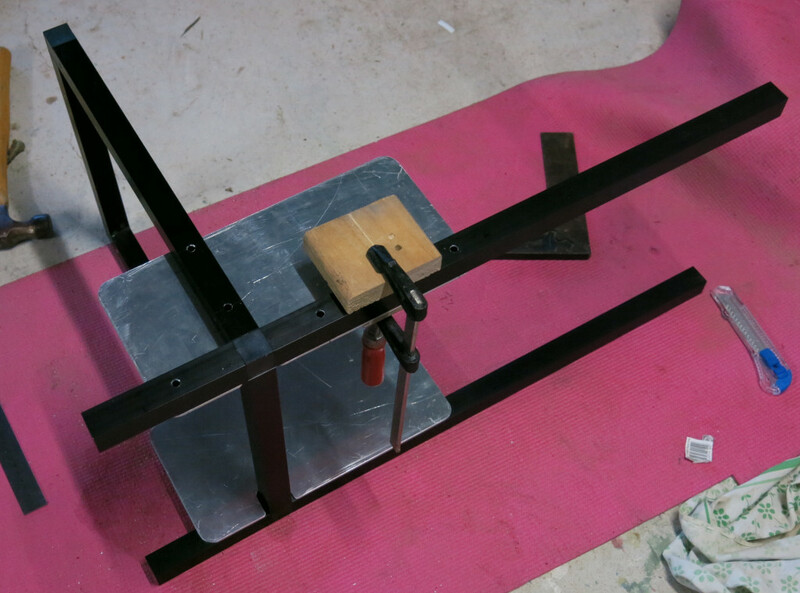 The software is all but done, USB still to be finished and the frame is nearing completion. The final work will be released next month. Unstained pine controller box. 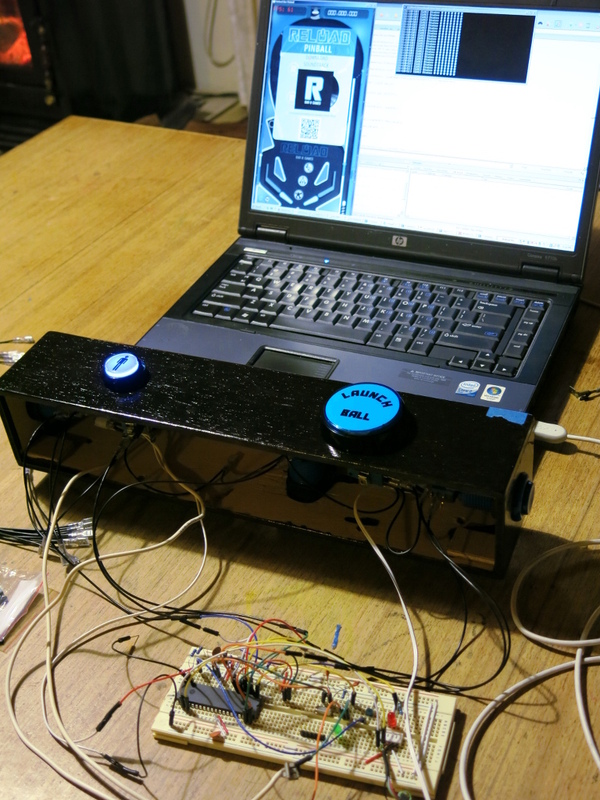 Will contain five buttons, a tilt mechanism, and embedded microcontroller for the USB. Aluminium framing and connectors that will be used. 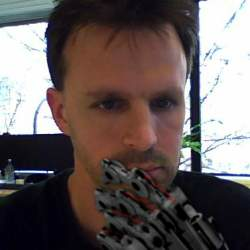 I won't commit all those parts together until towards the end of construction. Once together, it doesn't come apart! The controller was stained and varnished last week, and this weekend I had it mounted on the front section of the frame. 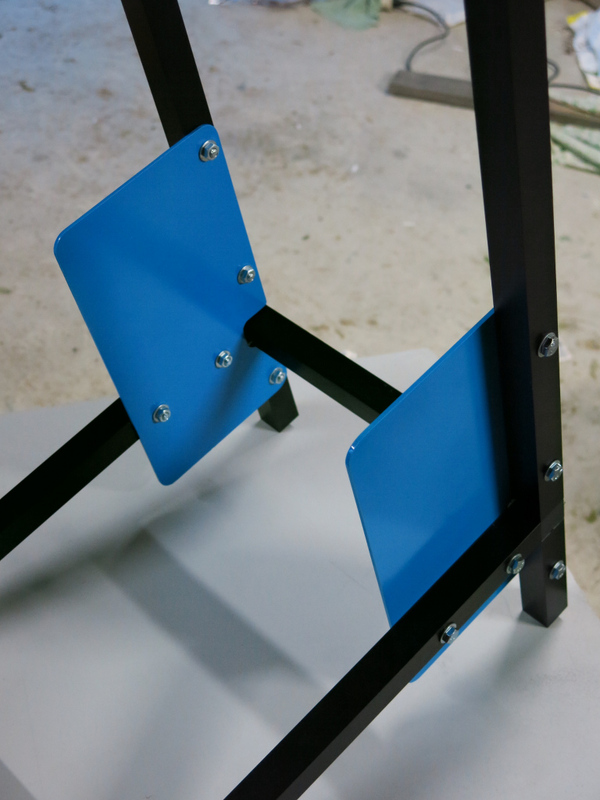 Also shown are the painted blue monitor brackets. The screen arrived and is 1920x1080 rez to match that of the game. It's a 4ms screen so should be great for the fast motion (though the test laptop can't drive the fps that high so couldn't test). But it looks good overall visually. 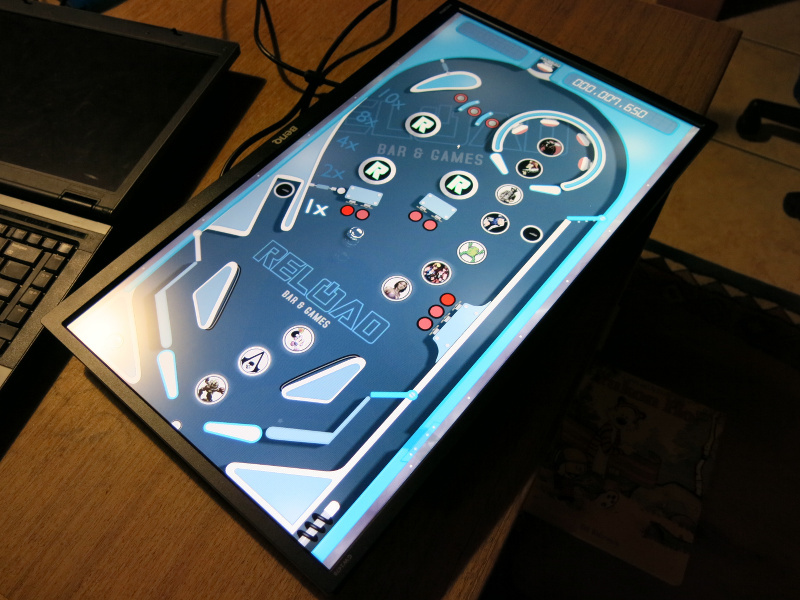 Also this is a 178/178 viewing angle screen so that onlookers watching someone play it in the bar won't get distorted colours. 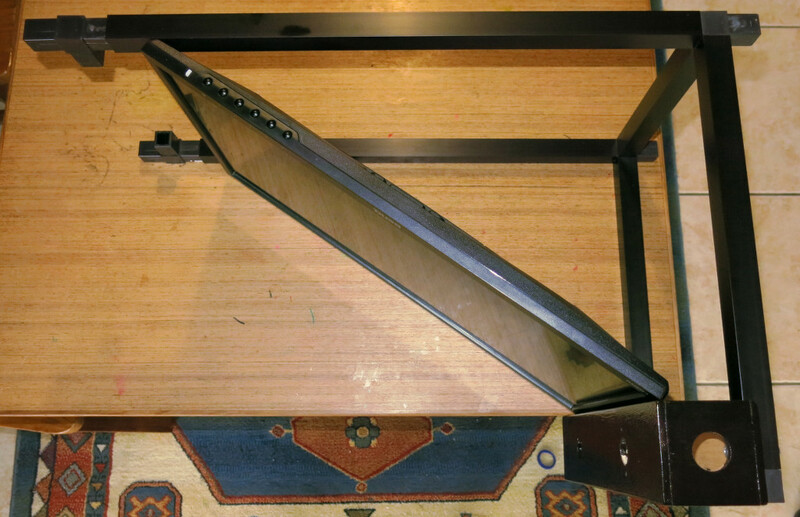 Some of back frame parts committed together. Once this stuff is joined, it can't come apart. This is a placement test for the monitor to ensure I get the positioning right. Control buttons, and mercury tilt switches placed. This is the electronic circuit design on a breadboard. 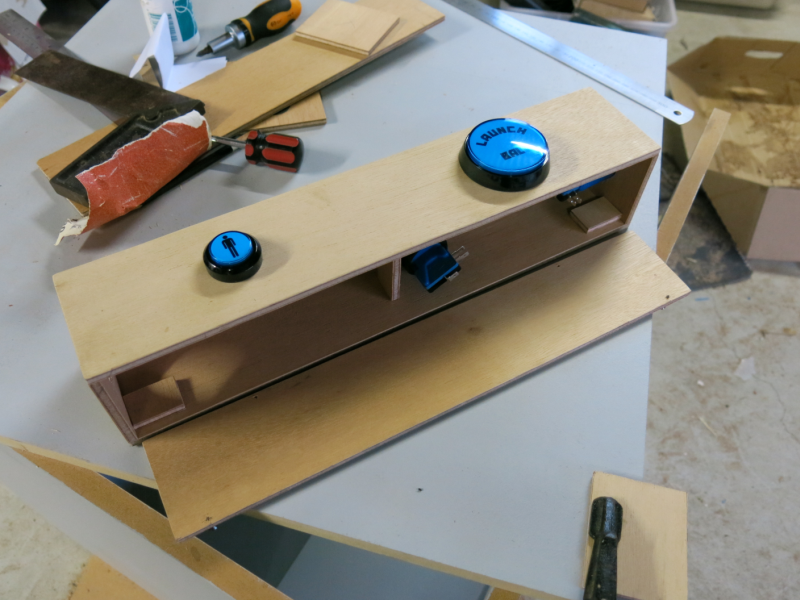 It has seven input pins for the seven switches: left flipper, right flipper, player button, launch ball button, admin button, and two tilt switches. 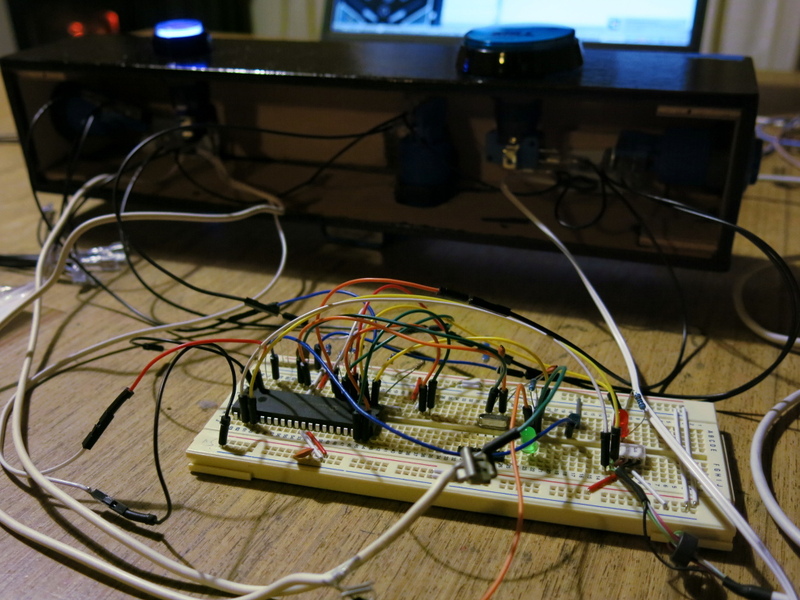 There are two output pins controlling the launch and player lights. 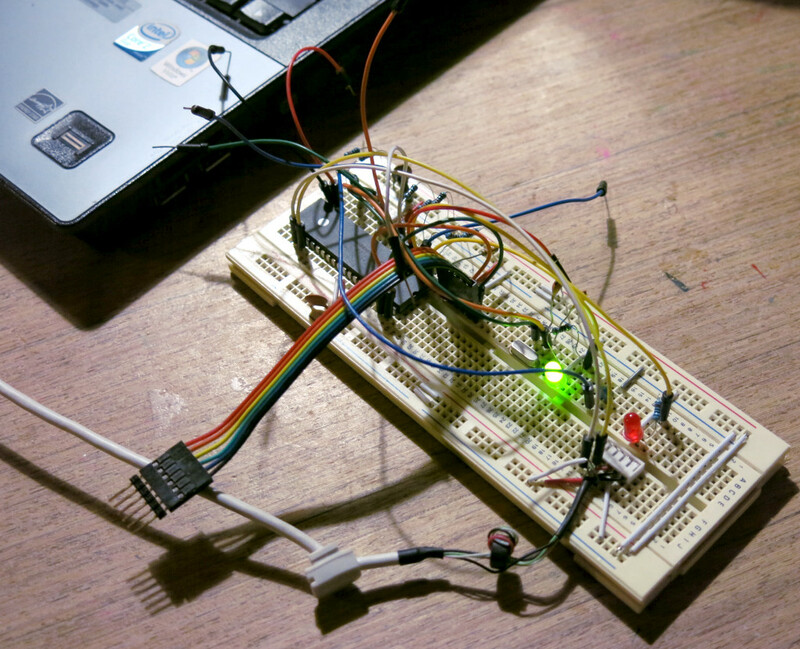 The microcontroller used here is the pic18f4550 which has an onboard USB module. Test placement of the side art brackets, ready for drilling. 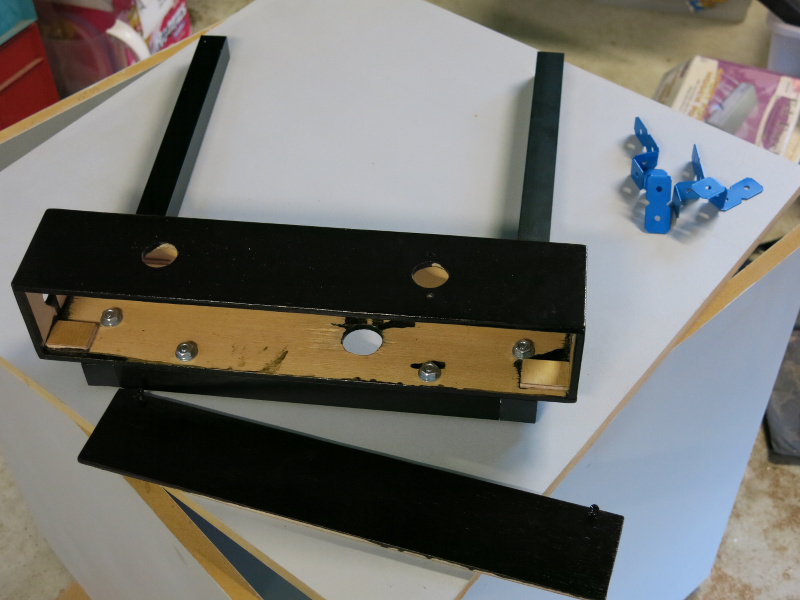 The brackets still require sanding, priming and painting. 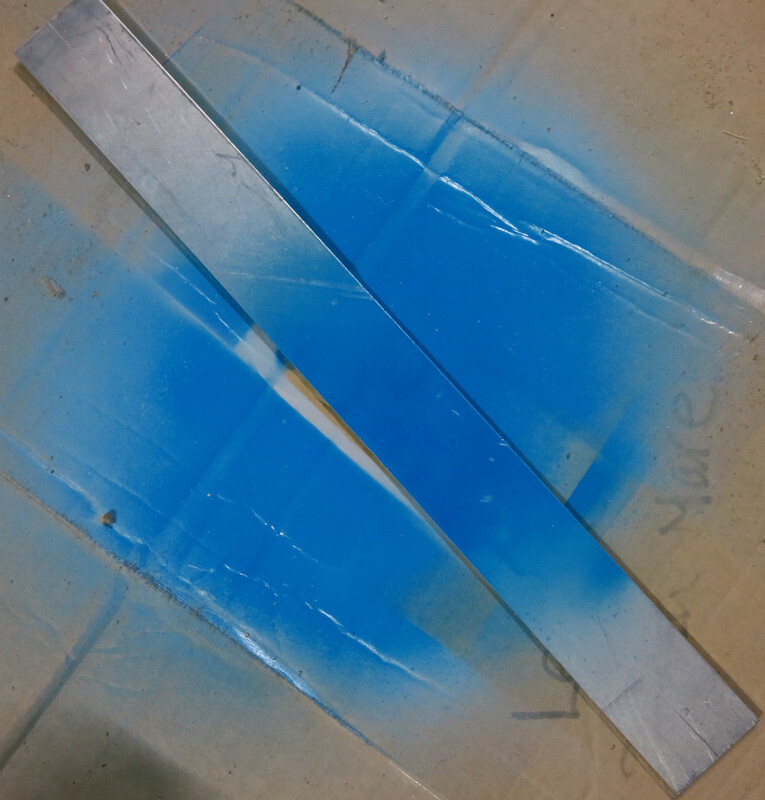 This is a painting test for aluminium. Portion was sanded, then metal undercoat, then top spray colour. Cannot be scratch after 24 hours. Beforehand, you can easily scratch the paint off. Exciting moment for me. First actual play of the game using the controller. All the switches work, and the player button flashes when there is no game in progress. A little hard to see from the photo. And here is a closeup of the prototype electronics. Next step is to move these to a real board and mount it into the controller box. Side brackets are done and bolted into place. This was a bigger job than first thought. It meant a lot of prep work, hand sanding the aluminium plates, washing, primer coat, and finally the colour spray. 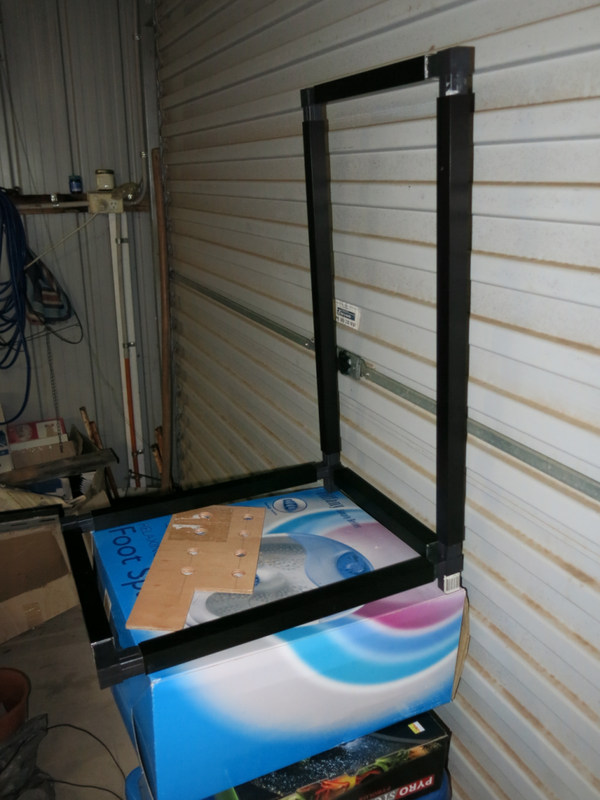 In short, the unit was installed into Reload Bar & Games in Canberra, and all turned out successfully. Three weeks later, I was asked to produce a second unit, with different gameplay mechanics and design which was used at Xerocon South 2016 in Brisbane. In my spare time, extras are being added like a highscore entry system and minor bugs, but overall, this project is complete. I've returned to this project to add Highscore table support. So will be installing this pretty soon. Also doing this with the Xero table as well. Nice to be back on this project again.